Commission Killer, by Craig Kaye and Rob Walker and found at commissionkiller.com, is an online marketing educational system that claims anyone can learn how to use regardless of experience or computer skills. They also claim you can make up to a $1,000 daily on automatically with just a line of code programmed into the software. However, the training program has several problems. For starters, the system used collects pre-existing content on other sites and alters it a bit. It is a practice known as spinning, and Google and the other search engines frown on this type of method. This defines the other various problems. Number two, it infringes on others’ materials, and two, it has no worth and will do the opposite of bringing in traffic. You can thank programs like this for the infamous and drastic Penguin and Panda changes put into practice by Google. Three, Commission Killer omits key details on steps needed to drive traffic to your website. They teach through the method of video training instructions, but you will not find anything in the members’ area that leads you to real answers. Four, the bonus PDF documents included cannot be opened for some reason, most likely because they are defective files. Five, since the system does not provide worthwhile or genuinely educational material that would bring you success, which means that it makes the multiple domains and hosting they sell you a complete waste of your hard earned money. Six, customer service leaves a lot to be desired. In fact if there were actually any kind of support, it would be appreciated. I expect at least that if I’m going to shell out the near fifty dollar fee they charge you. Last but not least are the upsell packages they hope you will be a sucker to buy. However, in Clickbank’s defense, not Commission Killer’s, you can get a refund through Clickbank, so I can’t really call it a scam. I’d just rather not recommend it to anybody. 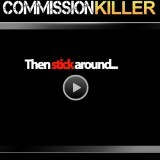 You will not make much money with Commission Killer. Or is it Commission Killed? Stay away from this one.